During the Department of Electrical and Computer Engineering’s (ECpE) centennial celebration, the department initiated an effort to create an ECpE Alumni and Friends Corridor to acknowledge, honor, and remember the department’s alumni and friends. For questions about the Alumni and Friends Corridor, contact Sara K Harris at 515-294-1097. 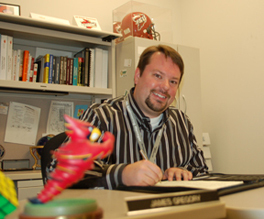 Jim Gregory, an electrical engineering alum, is a senior engineering manager at Rockwell Collins.